Researchers working in Greenland have found traces of microbial life in our planet’s most ancient rocks. The discovery pushes back the oldest evidence of life on Earth by about 220 million years, showing just how habitable our planet was during its earliest stages. The question of when life first emerged on Earth has challenged scientists for centuries, but a new study in Nature offers the oldest fossilized evidence yet for the presence of life on our planet. The discovery was possible because of the ongoing melting of perennial snow and ice in Greenland, a landmass that hosts some of the oldest rocks on Earth—including some of the oldest metamorphic rocks. Geologist Allen Nutman and colleagues from the University of Wollongong in Australia have uncovered 3.7 billion-year-old microbial formations in Greenland. The discovery shows that life arose on Earth relatively early in its history, and that it was able to survive the harsh conditions of the Hadean epoch. Specifically, the team identified 1 to 4 centimeter high fossil stromatolites embedded in rock found in Isua, southwest Greenland. Stromatolites are sedimentary formations created by the layered growth of microorganisms. Metamorphic rock is usually too warped and weathered to reveal traces of its geologic past. But the samples found in Isua still contained remnants of its sedimentary history, revealing the tell-tale signs of stromatolites. They don’t contain any organic or cellular remains, but their conical shape and finely layered textures are consistent with the presence of microbial remnants. At the same time, the researchers were able to rule out other possibilities, such as weirdly folded rock. The 3.7 billion-year-old rock with signs of microbial life. (Image: Nutman et al., 2016). Another oddity was the extreme age of the rocks. Stromatolites are well known to geologists and paleontologists, but they’re typically found in rock aged between 0.5 to 3.5 billion years old. The rocks found in Greenland were the oldest fossils ever found on Earth. Prior to this discovery, the oldest known stromatolite layers were found in 3.5 billion-year-old sedimentary rocks located in Australia’s Dresser Formation of the Pilbara Craton. By analyzing the metamorphic rocks, the researchers were able to paint a picture of the surprisingly habitable environment in which these bacteria-like organisms lived. The setting was likely a warm, shallow, mineral-depositing aquatic environment similar to those found much later in Earth’s history. The researchers were even able to discern piles of rock fragments that were likely deposited during a storm. These primordial microbes lived, swam, and died within this shallow marine setting, their organic remains collecting at the bottom for millions of years. Give life half an opportunity and it’ll run with it. The timelines are consistent with other lines of research, including mineral studies. The new evidence presented by Nutman and his colleagues strengthen the hypothesis that life emerged on Earth over 4 billion years ago during the Hadean epoch, a mere 540 million years after the formation of the planet. 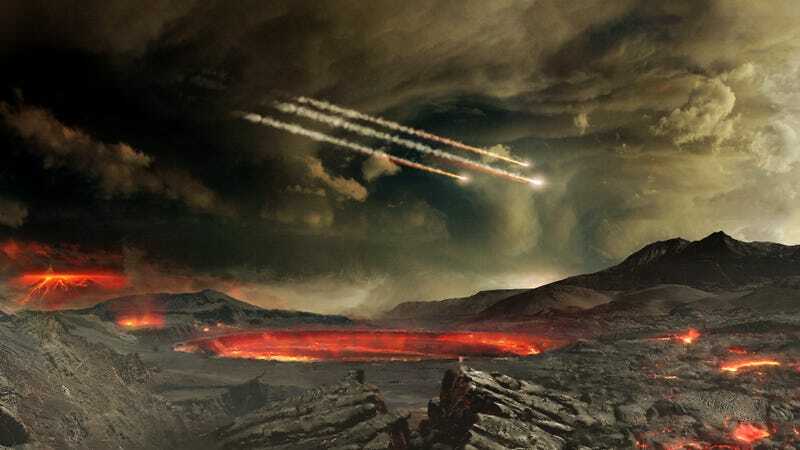 So the conditions for life on Earth were established very early on, and these early organisms were able to survive the harsh conditions found on our primordial planet, such as the steady bombardment of asteroids and the noxious effects of super volcanism. It also shows that traces of ancient life may eventually be found on Mars.